New approaches are needed to regulate Afghanistan post-2014. Gen. Anatoly Kulikov discusses the situation on the ground in Afghanistan. Following the withdrawal of U.S. troops in 2014, the general believes the struggles between Afghan factions could be exacerbated if an international presence is not maintained there. However, if relations between Russia and the West can overcome certain obstacles, Kulikov believes that Russia could help the West stabilize the situation in Afghanistan. From a Russian perspective, the situation in and around Afghanistan is not entirely auspicious. This is because, over many years, the U.S. has not only failed to achieve its goals but has also created a situation in the country that could implode following the scheduled withdrawal of troops in 2014. 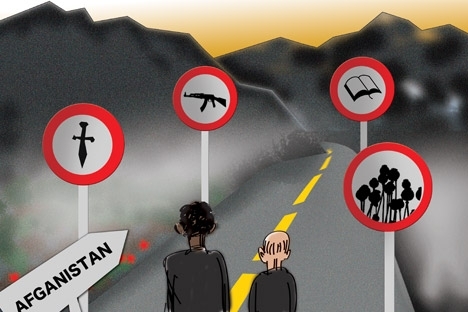 The Taliban has not been defeated, while indignation among the civilian population at the continued presence of a foreign military contingent is on the rise; the ad-hoc local authorities are unable to manage their own regions. In recent years, the situation has continued to worsen, as the fundamental socio-economic, ideological and military issues remain unresolved. The country is essentially a dual power: as a result of the efforts of the international community, the attributes of government are in place, and elections have been held, including at the local level. But it must be recognized, however unpleasant it may be, that real power lies in the hands of the Taliban (through its influence on religious and ethnic matters) and the authority of local warlords. By drawing upon a very diverse range of expert views, opinions, and assertions on the subject, the scenarios most likely to unfold in post-2014 Afghanistan can be generalized. The first scenario is based on the fact that, despite the stated withdrawal, the American factor will remain dominant. The United States is unlikely to leave Afghanistan, if only because of its favorable geographical position. According to reports, the U.S. is in talks with the government of Hamid Karzai on the establishment of permanent military bases and the continued presence of thousands of army instructors, special units, and air divisions until 2024. Meanwhile, it should be recognized that these forces would be sufficient to contain the Taliban and inflict damage upon them. The U.S. needs to continue to develop the Afghan army to make it capable of carrying out combat missions independently, but Washington no longer has the seemingly limitless resources that it possessed at the dawn of the George W. Bush era. The defense budget for 2023 is to be slashed by $400 billion. Because of this, Washington is seeking other ways to keep a foothold in Afghanistan without breaking the national treasury. If Washington fails to do so, the situation in Afghanistan could develop according to the second scenario, which runs as follows: due to the loosening of NATO's grip over the region and the de-escalation of much of its military presence, centrifugal forces will come into play. That means local leaders and warlords (many of whom nominally do not oppose the Kabul government) will begin a new recruitment drive. Such a scenario would immediately aggravate the acute geopolitical struggle within the country. After the start of the NATO mission, the West established a virtual monopoly on resolving the Afghan problem, despite the fact that other regional and international players had previously exercised more clout in the region. It is no secret that the majority of Afghan factions in the 1990s had close ties with foreign forces, and many experts considered the civil war in Afghanistan to be a conflict of external geopolitical interests fought on the ground amongst Afghans. In light of such experience, it is safe to say that, if NATO draws down its troops, a repetition of the events of last century is in the cards. Cooperation between Russia and the West on the Afghan issue is seriously complicated by the jockeying for position in post-Soviet Central Asia and the differences in values and ideology. If these contradictions can be overcome, Russia could play a key role in assisting the West to stabilize the situation in and around Afghanistan: for example, by keeping the northern transportation route open; helping the legitimate Afghan government and anti-Taliban forces; increasing military and economic aid to Central Asian countries to create a "security belt" around Afghanistan; contributing to the efforts of the Collective Security Treaty Organization, the Shanghai Cooperation Organization, the European Union, and NATO. The path to dialogue is long and hazardous, and success is not guaranteed. Along the way, vigorous measures are required to ensure economic revival and the creation of an effective government. Today, there would seem to be no other option but to search for a dialogue with the leaders of the Taliban, thereby involving them in the administration of the country under a coalition government, and integrating them into the power structure of the state in order to create the conditions for economic development. Anatoly Kulikov is an army general and chairman of the Military Chiefs Club of the Russian Federation. First published in Russian in VPK Daily.